Looking to refresh your style? Or maybe you just need to touch up some highlights? Whatever it is you’re looking for, the first-rate hair salons of New Hampshire have you covered. And who knows, you just might find your new regular spot! Here are the 10 best in the state. You’ll love the elegance but you’ll still feel very much at home at My Reis. From the moment you check in and are offered coffee or a glass of wine, until the moment you see the results of your stylist’s efforts, you’ll love the pampering here. Ask for Amanda. She’ll get what you want or need right away. She’s tops at making hair dreams come to fruition—in the most amazing ways. Simple elegance is the underlying theme at Troupe Studio, and that theme is present in the styles they create. Chris specializes in both men’s and women’s styles, and has a list of clients who boast about what he does for and with their hair. He’s great at making style suggestions, too. Check out Troupe for a fresh new style. Want a few foils? Bayalage? Maybe some hair extensions? Michael Thomas Salon provides these services and more. Keri Levesque is the Master Stylist. She owns and operates the salon. Her team of stylists, makeup artists and estheticians are Manchester’s best. You’ll leave looking—and feeling—your absolute best. CAUSE Hair Salon provides all the services one might expect in a full service salon—and more. They offer J Beverly Hills smooth realignment, permanent chemical straightening and deep conditioning treatments. 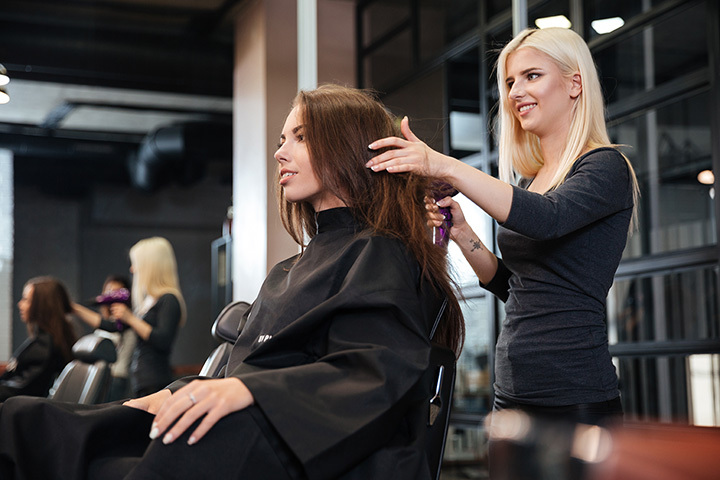 The stylist’s “CAUSE” is to make their clients leave feeling as good as they look. They even offer an adjacent wig service for clients about to lose their hair from cancer treatments. For truly customized color services, visit Siren Salon. Try baby-light highlights or bayalage. Consider a keratin smoothing treatment. Customization continues beyond color, too. Book a consultation and see what Siren can do for you. The Madd Hatter Hair Salon has been in business since 1987, and they’ve amassed a loyal following since then. Whether clients want a blowout, a color touch up or a full foil, they’ll get exactly what they want. The stylists here keep up with industry trends and are constantly continuing their education. They provide exceptional skin services, too. Studio 471 employs several color specialists, and that’s where countless Hampton and seacoast-area women and men go for a new look. They are tops in color correction for those who’ve attempted to color their hair from a box. The salon is reminiscent of those on Boston’s Newbury Street. Clients love the whole salon experience here. No matter the style or color you’re seeking, you’ll find it at Max Charles. The salon is part of a spa, and even if you’re not utilizing spa services, you’ll feel the essence just the same. Choose from a variety of hair services, as well as from various levels of stylists. Check online before you book, as they often offer specials you can utilize during your first visit. If you’re seeking salon services in the Nashua region, visit Aidan James Salon. You’ll walk out with a whole new sense of confidence. Consultations precede each service, and the stylists excel at making your style dreams come true. Ask about their specialty treatments, too. Visit the blow-out bar at Jessica Todd—or book one of the many high end services offered. Specializing in a full range of hair services, they also offer a wealth of options for special occasion styles.